Lecco’s historic centre preserves the walls and the moat that surrounded the medieval village. It is highly recommended to visit thereligious buildings. First of all the basilica dedicated to San Nicolò with its neoclassical structure, thanks to the expansion by the architect Giuseppe Bovara. A little further on there is the church of Santa Marta with baroque decorations. The Visconti Tower raises above the square, the only part of the original Visconti fortifi cation to survive the demolitions decided at the end of the XVIII century is now used as a museum and hosts temporary exhibitions. The central street of Via Cavour has a classical style and ends in the square dedicated to Garibaldi, where the “Teatro Sociale” designed by Bovara is located. Interesting is the church of Nostra Signora della Vittoria where there are frescoes of Friar Gerolamo Codega (XVI-XVII century). 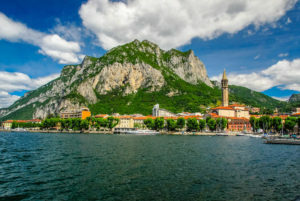 From the historic centre it is very quick and easy to reach Lecco’s districts, located around the mountain (Acquate and Germanedo) and towards Lake Garlate (Maggianico,Barco and Chiuso), as well as the hills at the foot of the Resegone, a perfect . starting point for walks on the famous peaks that dominate the city The Castello district is one of the oldest centres in the region, an elegant village where the Palazzo Belgiojoso is located, one of the few remaining traces from the antique settlement order, a precious building from the late eighteenth century. The historic Archaeological Museum has many rooms with relics from all over the Province, from the Medium Palaeolithic period (from 200.000 to35.000 years ago) to the Middle Ages (V-X century A.C.).Of particular interest are the Celtic grave instruments fromthe First and Second Iron Ages (X-I century A.C.) and the early medieval goldsmith works. The Museum of Natural History is one of the most ancient and important in the Region, it has twelve rooms of zoological and paleolithic collections and you can fi nd the extremely rare “Lariosauro”.Of particular interest there is also the Church of San Giovanni Evangelista from the Sixth century and the Church of San Giovanni Battista in the Laorca district with a rich stucco decoration from the XVIII century. Along the road towards Bergamo, is the district of Maggianico which in the nineteenth century was the meeting place for groups of intellectual writers and musicians involved in the Milan Scapigliatura literary and artistic movement. One of the protagonists was Antonio Ghislanzoni, poet journalist and librettist (he is author of the verses of the Aida and Don Carlos by Verdi).